• Coordinates and performs patient assessments as needed. • Coordinates development, implementation, and evaluation of Patient Care Plans. other nursing interventions as indicated by the Patient Care Plan or Physician Order. 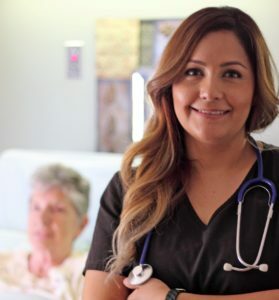 • Follows safety policies when performing nursing care. • Ensures supply and medication inventories are sufficient to meet patient needs. • Coordinates staffing pattern to meet patient needs. • Coordinates and/or participates in all assigned meetings and in-services. • Establishes unit work goals and coordinates delivery of care through supervision. • Follows required Company coaching and disciplinary procedures. • Presents professional image to consumers through dress, behavior, and speech. • Adheres to Company standards for resolving consumer concerns. • Ensures that all patient rights are protected. • Current nursing licensure in the state of California required. • Written and verbal communication skills in English for business necessity. • Administrative and organizational abilities necessary. • Current CPR certification required. • Two years of recent nursing experience in long-term healthcare preferred. • Current Registered Nursing Liscense preferred. Have you previously been employed at a Progressive Health Care facility? I hereby certify that the information in this form (and any accompanying documents) is true and complete to the best of my knowledge. I understand that any misrepresentation or failure to disclose information on this form may result in my disqualification from further consideration for employment or if employed my termination. I understand that the satisfactory completion of a background check and drug screen (conducted after an offer of employment) is a condition of employment with Progressive Health Care Centers. DO NOT E-SIGN UNTIL YOU HAVE READ THE STATEMENT ABOVE. By my eSignature below I certify that I have read fully understand and accept all terms of the foregoing statement. I consent to conducting this transaction electronically and I agree that my eSignature as the same force and effect as my handwritten signature on this document.